BEST Shredding’s parent company, BEST Service Pros, was founded in 1956 by Ulf von Dehn. Ulf built a reputation for world-class service through the development of a unique company culture. BEST Service Pros is now the premier choice for facilities services in Western Canada. Our Shredding division was founded in 2009. 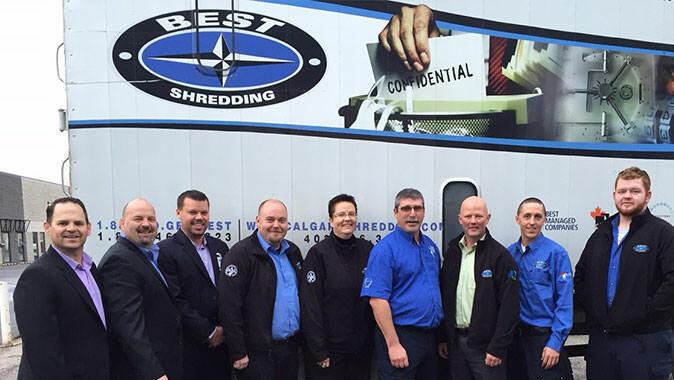 BEST Shredding provides on-site and off-site paper shredding, document storage, and media destruction services to customers throughout BC and Alberta. We focus on delivering secure, client-focused service that protects our clients’ confidential information. We have over 29,000 clients in Calgary, Edmonton, Victoria, Vancouver, and the surrounding areas. BEST Shredding is the professional choice for client-focused information security and destruction services. When a client chooses BEST Shredding, they are provided with high-quality, customer-focused service that ensures complete data protection. We believe that paper shredding and information protection should be easy and stress-free for each of our clients. Our highly-trained, fully-bonded team members work with you to develop an efficient document security program to meet your unique needs.